I love pretty much any baked goods with lemon. Can’t think of an exception. Lemon has a way of bringing carbs to life, which is probably why lemon zest is a central component to German and European baking at large. That and butter. Must have butter. But these muffins are made without butter. Not because I’m on a health kick, but because I deliberately wanted to use something else instead…something to add a flavor and freshness and moistness that is wunderbar! Coconut oil. Love, love coconut oil. Whether it’s on my skin or in my tummy, coconut oil has my loyal fanship. 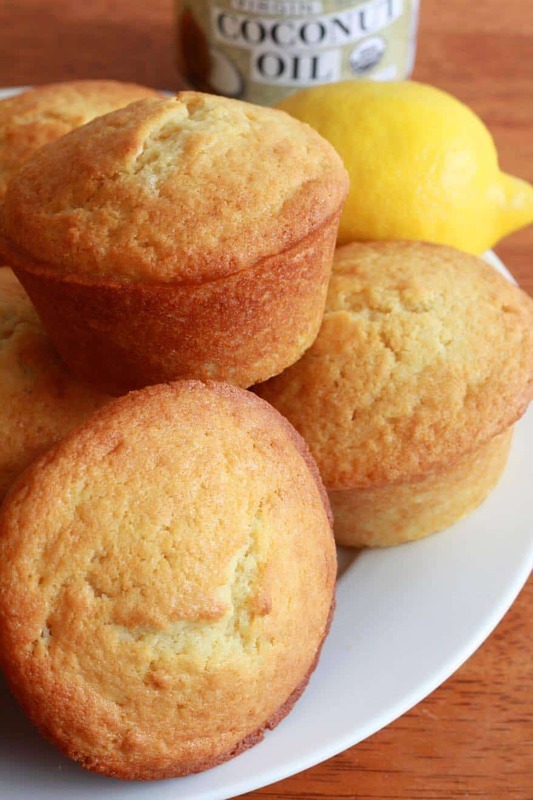 These muffins get a double kick of lemon, using both fresh lemon zest and lemon extract. 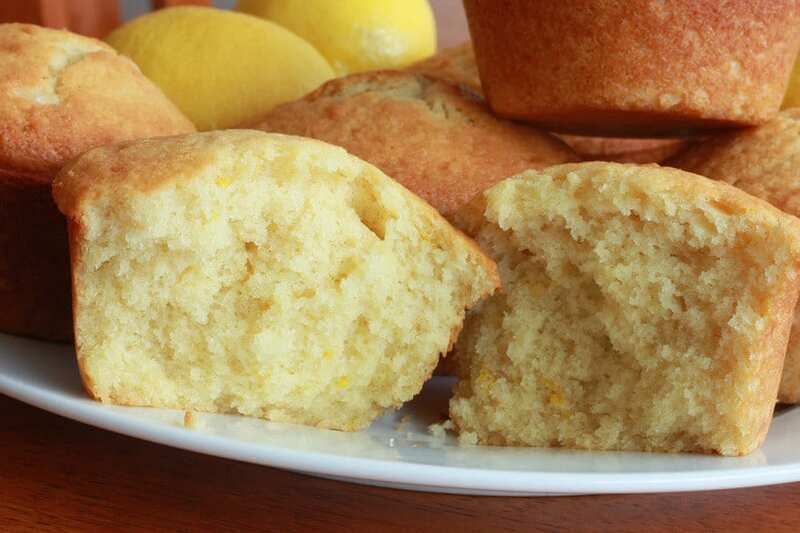 I like my lemon muffins lemony, how about you? The texture of these muffins…perfect. 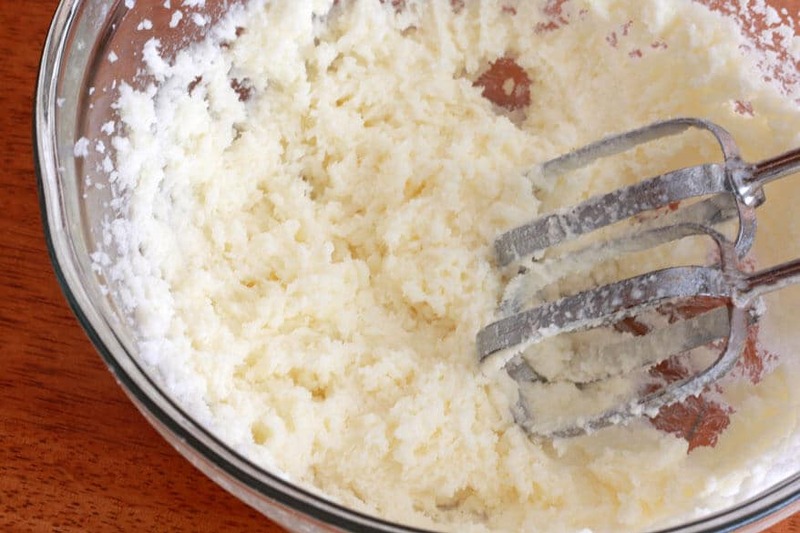 Buttermilk is a miracle elixir in baking. It contributes not only a fresh and tangy flavor, it creates a deliciously moist and tender crumb. Just take a look at the center of these muffins…yep, that’s what I’m talking about. 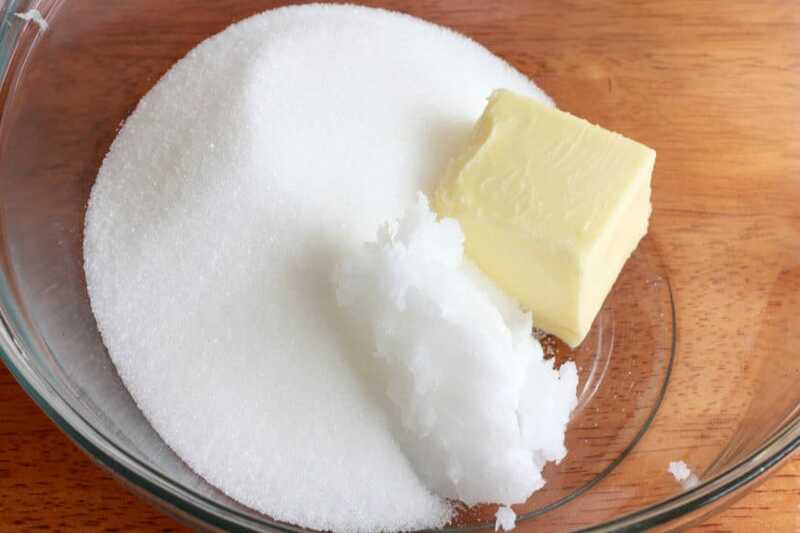 Place the sugar, butter and coconut oil in a large mixing bowl. Add the zest, lemon extract and eggs. Optional: I personally prefer the dominant flavor to be lemon and I’m not a huge fan of artificial coconut flavoring, but if you really want even more coconut flavor, you can add a teaspoon of coconut extract as well. Add the buttermilk. Beat just until combined. Beat just until combined. Be careful not to over-beat. 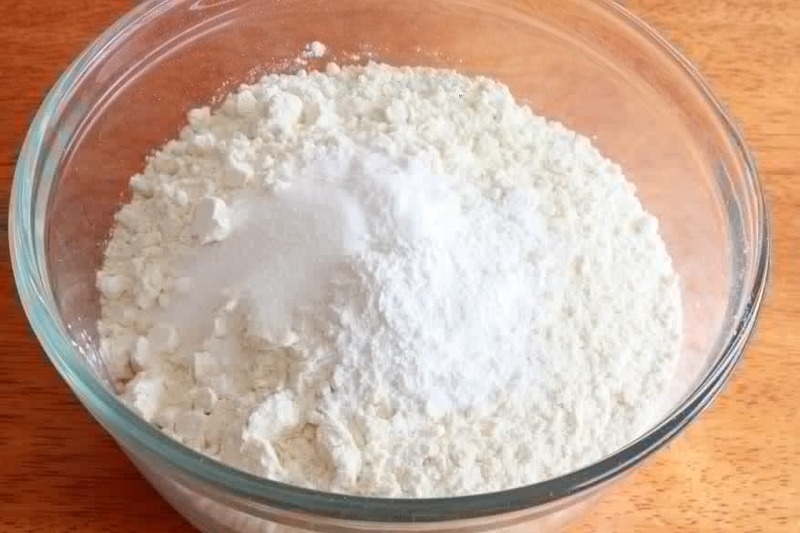 Some lumps of flour will remain and that’s okay. Grease 6 jumbo muffin tins and scoop the batter in, about 3/4 full. Optional: Add some extra zest to some sugar and sprinkle over the top. Another option: Sprinkle some flaked coconut on top. Bake in an oven preheated to 375 degrees F for about 25 minutes, or until a toothpick inserted into the middle of a muffin comes out clean but moist. Be careful not to over-bake or the muffins will be dry. 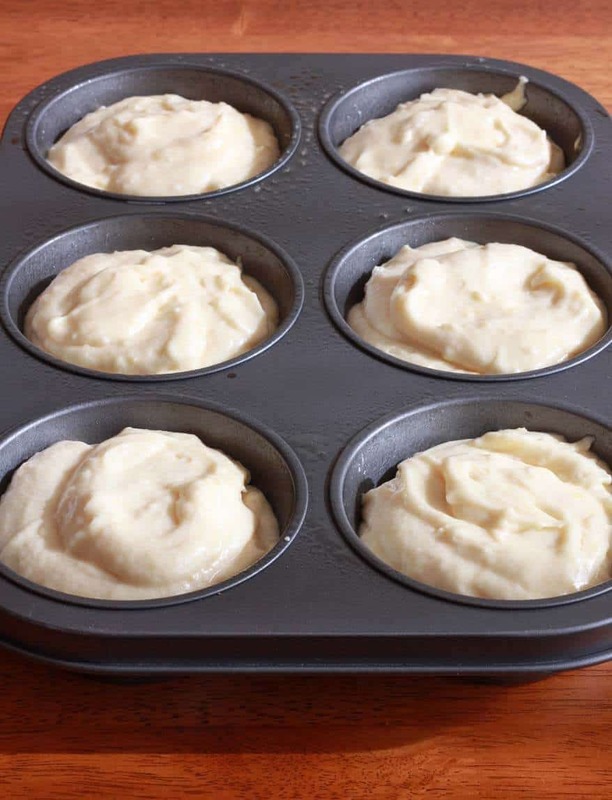 Let the muffins cool in the muffin tins for at least 5 minutes before transferring to a wire rack to cool completely. Low quality lemon extract smells strong out of the bottle, but when its baked it loses its flavor. Either use high quality lemon extract or double up on the low-grade stuff. Optional: Combine some extract lemon zest with some sugar and sprinkle over the filled muffin tins before baking. You can also sprinkle with some flaked coconut. Optional: I personally prefer the dominant flavor to be lemon, but if you really want even more coconut flavor, you can add a teaspoon of coconut extract as well. These sound delicious. I can’t get enough coconut oil! It truly seems to be a miracle food. Thanks, Jamie! I LOVE coconut oil, too! I use it in most of my baking. I made these tonight and they are yummy. They looked a little funny because they were lumpy due to my fear of over mixing from your warnings in the recipe, but they are just fine! So moist! Thanks to you, I am now buying buttermilk in the quart size instead of the little pints. And now I think as I pick it up, “What kind of crazy person DOESN’T buy the bigger size? Geez!” I am a converted buttermilk fan. Hi, Susan! Yay!!! You know, I maybe I do go a bit overboard in instilling the fear factor about over-mixing! 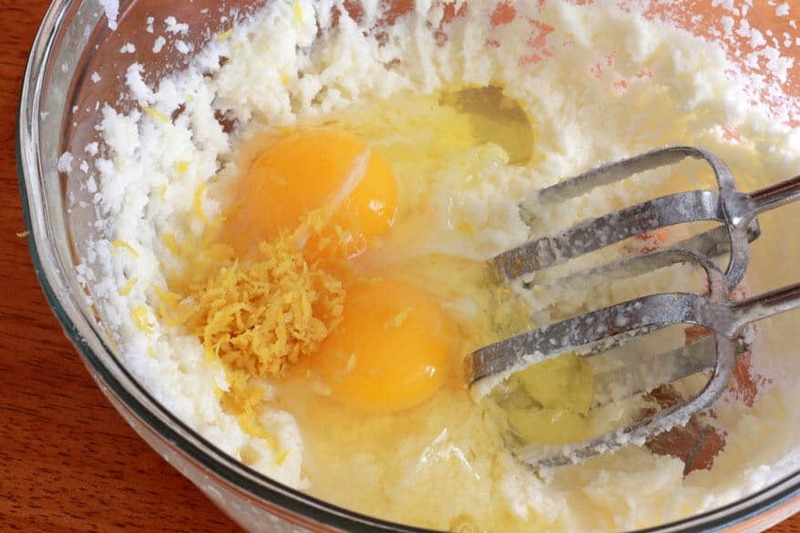 It sounds like you can safely mix it a little more next time :) I know, isn’t buttermilk great?? 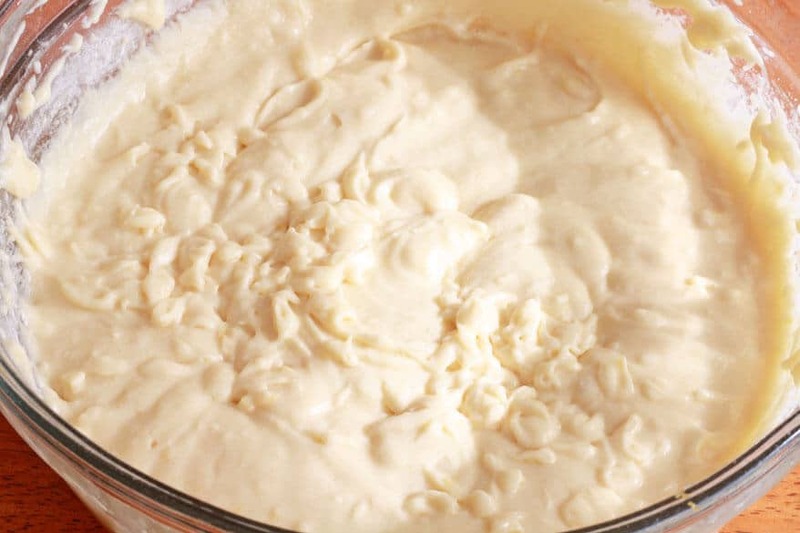 It’s one of my #1 go-to ingredients for baking. 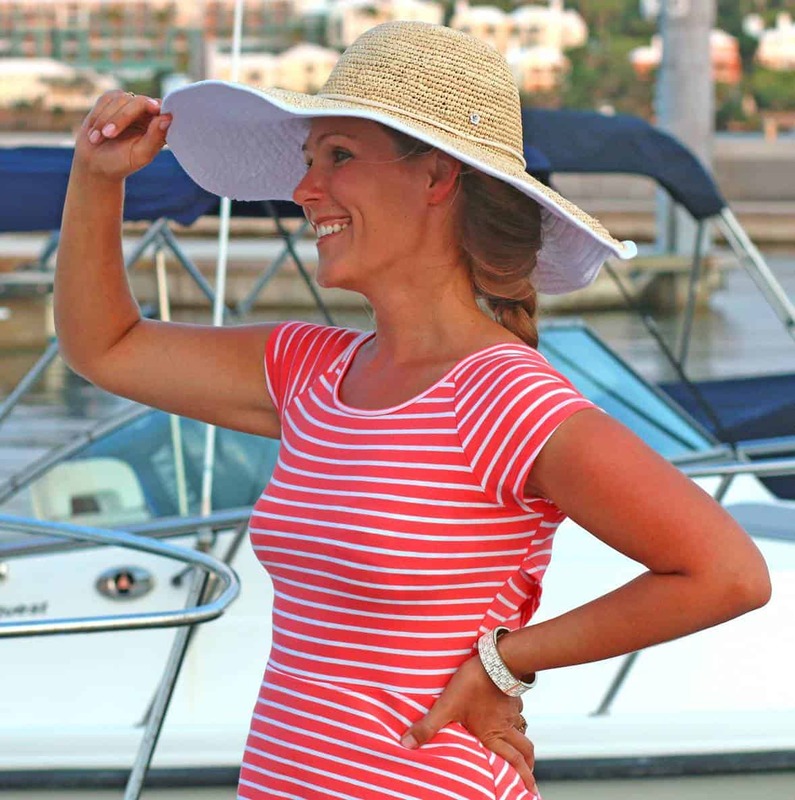 So happy you’ve been converted and thank you so much for your feedback! I just made these and they are totally yummy! I added some shredded coconut and did the extract plus an extra teaspoon, for extra lemony flavor. Hi Jeanie, I’m so happy to hear that! 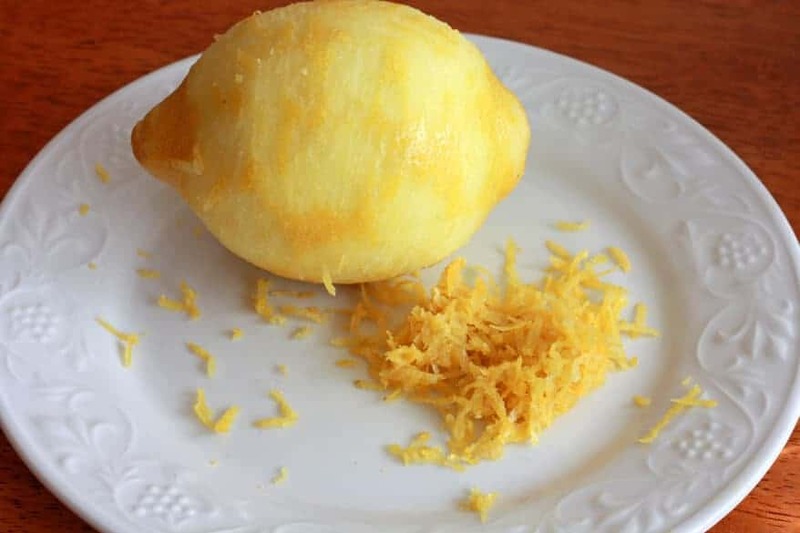 I love really lemony things, too, so I often like to add lots of zest and fresh lemon juice to things. 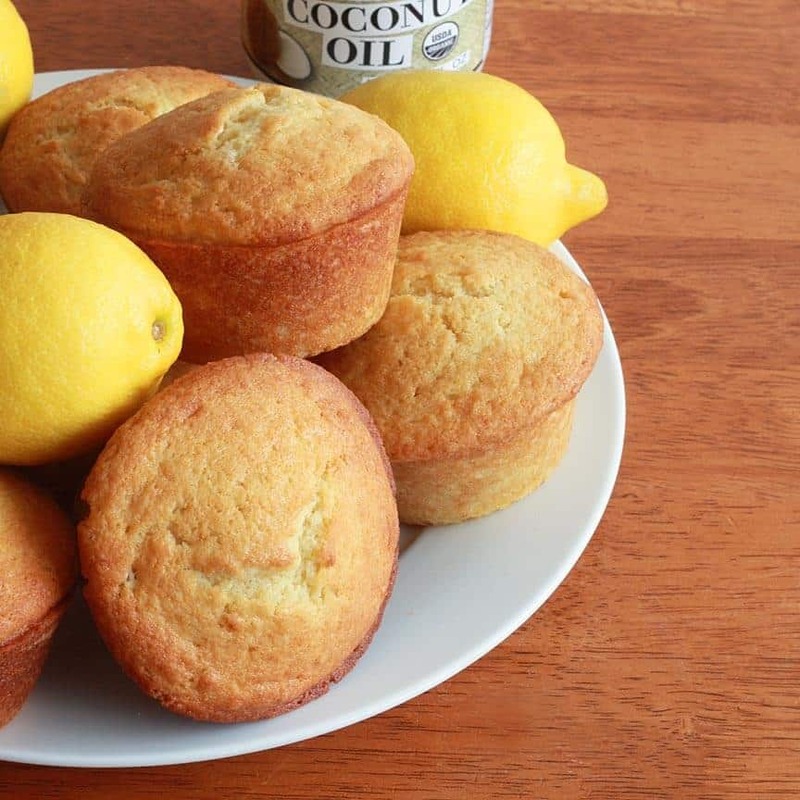 These muffins will stay nice and moist too because of the coconut oil. Thanks for making them and for your feedback! Hi Nicole, that’s fantastic! That flavor combination sounds yummy and that’s wonderful to hear that your daughters made it! Thanks so much for your feedback! Where do u find coconut oil or can I substitute with something else like coconut cream? Hi Kylena! No, you can’t substitute it with coconut cream, it needs to be the oil. You can find coconut oil in most grocery stores, in virtually ever supplement store (like Super Supplements), and online. I’ve just added a link to the recipe box where you can find a highly reputable brand online. It’s bulk quantity and is one of the best bangs for your buck. Coconut oil is extremely versatile so you don’t have to worry about it going to waste. You can use it in any baking recipe that calls for oil and can use it in place of vegetable oil for making stir-fry’s, just for example. It’s also fantastic for your skin! I made these this morning, they were divine. I made half a batch as it’s just me and my husband. As I don’t use all purpose flour, I used 1/3 cup organic potato starch, 1/3 cup of barley flour and 1/3 cup of spelt flour instead. I only put 1/4 cup of sugar. I added lemon juice instead of lemon extract. Funny fact, while they rose beautifully, they rose straight up so I ended up with 6 nice flat-top muffins. This was a first in my baking carriere. Nonetheless, they tasted wonderful. My husband requested I add poppy seeds next time as he always associated lemon cakes with poppy seeds. Can sugar be replaced with honey? Hi Ayesha, yes it can but you’ll need to make a couple of additional changes: 1) Honey is sweeter than sugar so use 1/2 cup to 2/3 cup honey. 2) Reduce the buttermilk to 3/4 cup. 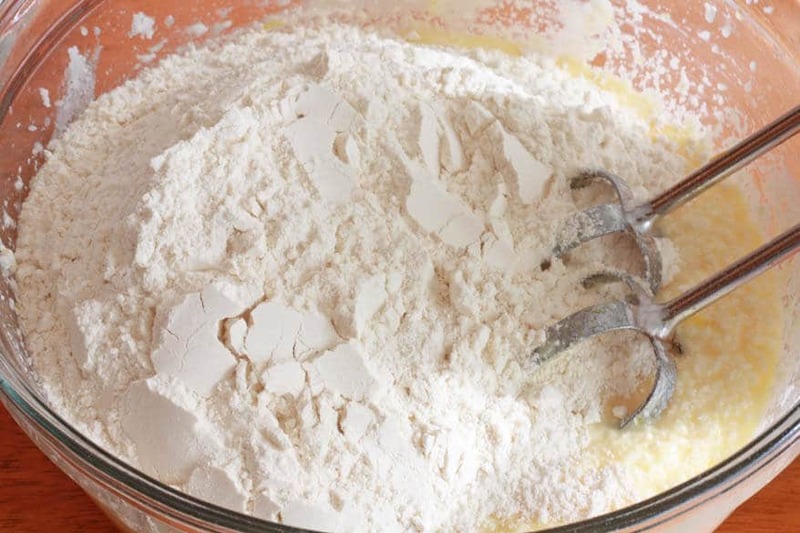 3) Increase the baking soda to 3/4 teaspoon. 4) Reduce the oven temperature by 25 degrees (baked goods with honey tend to brown more quickly). Happy baking! Hello. Since they dont sell buttermilk here,can I use homemade one? I often find the homemade one less thick than the store bought ones(or may be I am using a wrong recipe with quantities of milk sitting in lemon juice for a little while). Will this make a difference to the muffin? 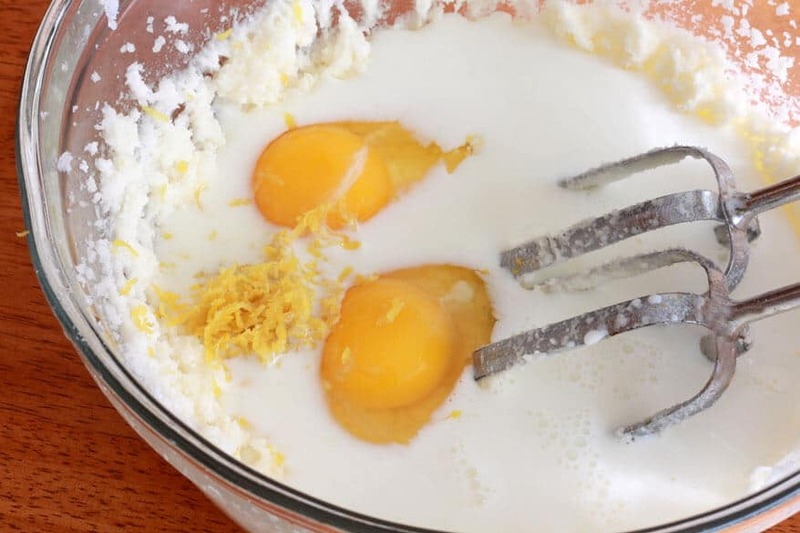 Hi Chamila, making it yourself using the milk/vinegar or lemon juice method isn’t the same as store-bought in terms of thickness or flavor, but it does accomplish the same purpose in adding acid to the batter and that’s what we’re after here. 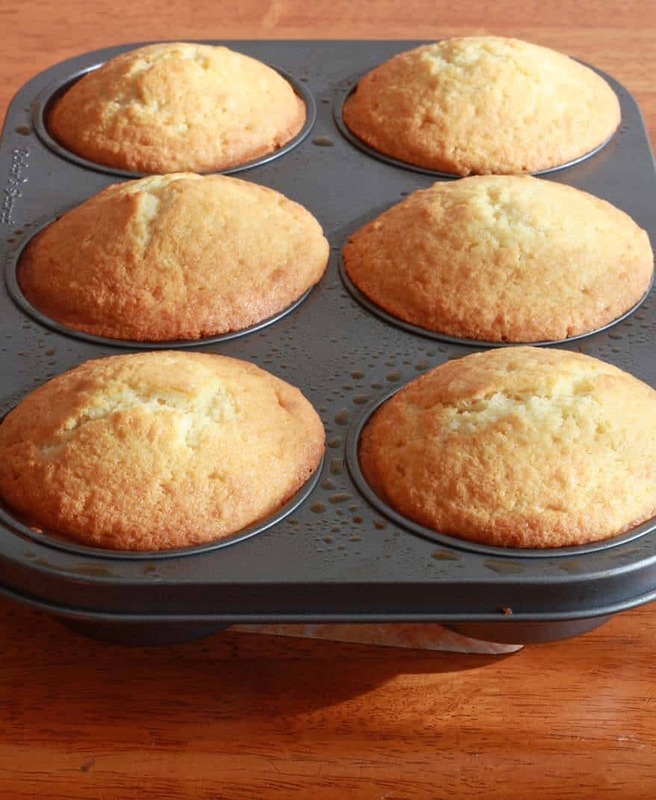 So yes, you can use the homemade buttermilk and your muffins will turn out delightful :) Happy baking! Wonderful. I often see extra virgin coconut oil in stores but never quite thought of purchasing as I am not quite into healthy eating. I’ve been browsing ur blog this whole weekend and It seriously made me think! I’m up to purchasing that oil on Monday and will try a few priorities for the time. Your granola and those muffins. Thank you for another great recipe! My husband thought it was with quark, so delicious and moist they were! Wonderful, Monika, thank you so much!